Peace Haven came the first of August with puppets, crafts and games for a Vacation Bible School. The first day we spent decorating, preparing and visiting the children in the community. This is one of my favorite things to do because I love getting to know the kids and where they live and who their parents are. Peace Haven brought balloon animals and candy which gave us quite a following of children in Jocotillo. 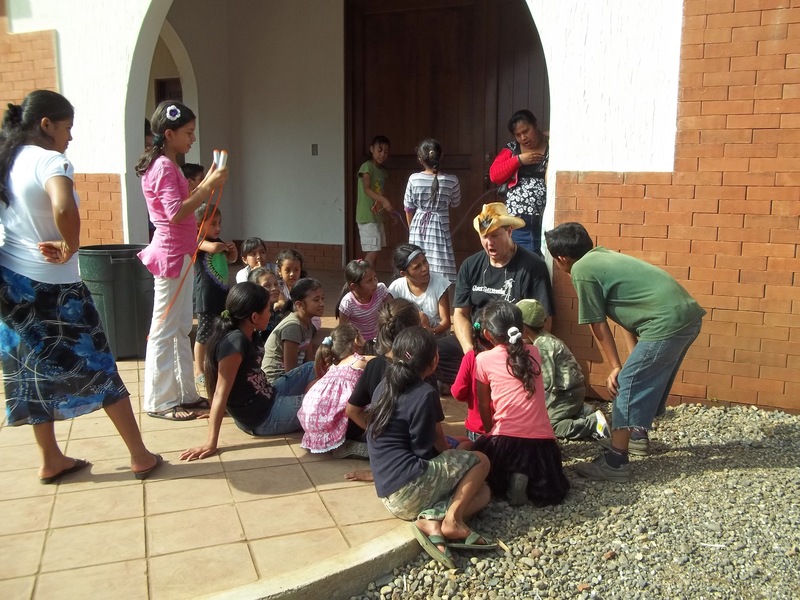 We had VBS for 3 days with around 80 children every day. Some of the mothers came and I think they enjoyed the crafts as much as the children did. We made picture frames the first day and took pictures of all the children. They were so excited about getting a picture of themselves and I enjoyed watching the mom’s fix their children’s hair and make sure they smiled pretty. Every day we played with the children while they arrived and then went together into the church. Peace Haven performed puppet songs, puppet skits and it was fun to watch the children because they didn’t even know what puppets were. Vincente would teach them a Bible lesson and then we would break off into groups of boys and girls. One group played games while the other did crafts. At the end we came back together and sang songs before we dismissed. The last day George, one of the pastors from Peace Haven, told the Bible lesson. He began with what I have heard is one of his most famous stories about two horses….I will let him tell you the rest some day. Bobby was translating and I couldn’t decide who to watch, George galloping around the room or Bobby trying to imitate him…What a good time we had! Thank you Peace Haven for being Jesus to the children in Jocotillo. Your light shone strong and I am so excited to see what God is going to do in the lives of these, His precious children. Lesson learned in VBS: While candy is falling from a broken piñata – watch out for running mothers!